Do you think it will catch on?? Thread: Do you think it will catch on?? 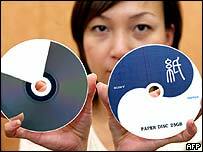 TOKYO (AFP) - Electronics giant Sony and another Japanese company have developed a "paper disc" that can record more than two hours of high-definition images and be destroyed with scissors for foolproof data security, officials said. The 25-gigabite Blu-ray optical disc is 51 percent paper and was developed jointly with Toppan Printing Co. Ltd. of Japan. "Since a paper disc can be cut by scissors easily, it is simple to preserve data security when disposing of the disc," Toppan managing director Hideaki Kawai said in a joint statement with Sony. Masanobu Yamamoto, senior managing director at optical disc development division of Sony, said the firms were able to use paper in the new disc as the Blu-ray technology does not require laser light to travel through the substrate. The technical details of how it is possible to use paper as a data storage disc would be disclosed Tuesday at a conference in Monterey, California, according to Sony. The combination of paper material and printing technology is also expected to lead to a reduction in cost per disc and will expand usage, the two partners said. It has yet to be decided when the disc will be commercially available. The use of paper in electronics products is not new for Sony. In 1950 when Japan was still struggling to rise from the ashes of World War II, Sony, then called Tokyo Tsushin Kogyo, made magnetic tapes using a similar grade of paper to that used for ordinary envelopes. Sony used racoon hair brushes to daub magnetic powder over the paper to produce what it cally "SONI TAPE", starting its history as an audio-video products maker. The Blu-ray disc format allows high-capacity optical-disc storage to be used for such technologies as high-definition televisions. Wonder how many houses will be burnt down after someone cleaning up shreads the new work presentations on that paper disc? But if it's made of 51% paper can it also be wet and when paper is wet it can be easily torn. But paper seams a weak substance for this. i could go on. But maybe those things are not a problem at all it's only 51%. I doubt I would use it for anything important but I would also guess that you would have to buy a different CD burner for these CDs which is why it won't be as popular because not a lot of people are going to buy another cd burner and i don't think gaming systems would use it due to the fact that it can get easily damaged. phatcat, mind providing a link to where you found this? EDIT: Just read the DVD part well I for one would not buy a DVD and take the risk of losing it because of water or my 3yr old cousin tearing it up. And I suppose you would need to buy a separate DVD player which can read these type of CD's.. But - interesting development though. same way as it's possible to make a disc on plastic - What you'll probably find is that the main 'body' of the disc is paper and this is covered by a very thin layer of the reading layer (I forget off the top of my head what it's made off) which is where all the pits and grooves containing the data are. This is then probably coated by a thin layer of plastic (to protect the reading layer) which allows the laser light through to the reading layer and can then be bounced back to the reading head. Still having said that I would be interested in the technical details when they release them! Which brings me to my next question since it's made of paper you will be able to write on it with a normal pen/pencil instead of needing to buy a CD pen? um... really couldn't say - depends on if it's got a layer of plastic covering the paper I guess.